After pulling together four great radio blogs of Christmas music last year, I faced a major challenge pulling together a radio blog for this holiday season. I was uncertain which musical direction I wanted to take. After shuffling around tunes in my iPod for a couple of weeks, this is the end result. I would like to think of it as a spicy gumbo pot of Christmas music. I used a lot of music that I already had and the two new additions to my collection were the Christmas with Leontyne Price and reissued version of Vince Guaraldi’s A Charlie Brown Christmas with 4 previously unreleased bonus tracks. The selections in this radio blog range from 1949 to 2005. Grab yourself some egg nog or some warm cider (cuz it is even cold in California right now!!!) and enjoy the music. I took the photo above when I was back home in Chicago over the Thanksgiving weekend. 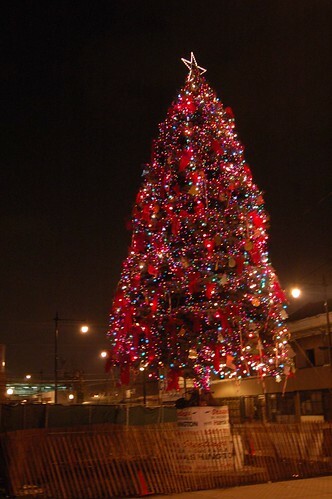 It is the Bronzeville Christmas Tree located at the corner of 47th Street and Dr. Martin Luther King, Jr, Drive on the south side of Chicago. This entry was posted on Monday, December 18th, 2006 at 11:05 am. It is filed under Radio.Blog. You can follow any responses to this entry through the RSS 2.0 feed. Music has never had a better friend than James Knox, and that friendship is again confirmed on his latest entry, Christmas Joy 2006. Voices ranging from Leontyne Price to Mahalia Jackson to Nat King Cole are included and their voices are as timeless as the songs they sing. So sit down, grab your eggnog or cider, your favorite blanket and let this music remind you of Christmas and the powerful gift of music. Enjoyed. We had an extended Christmas in Barcelona, where the season ends with the Three Kings celebration. Going back to do the ladies of jazz in March. What part of the Windy City are you from? I grew up in Chatham.